We have a DEFIB in the school office which we registered right away with North West Ambulance service. This means that if a defib is needed in this area when someone dials 999, the ambulance service knows to send someone to Padiham Primary School for the Defib which may be needed to “Save A Life” before the ambulance gets there. We had an instance not long ago where North West Ambulance service did this and it was good to know us as a school where able to help in the emergency. We have numerous staff trained in first aid that know the chain of survival, 5 staff trained in paediatric first aid and we also make sure all our year 6 pupils are trained in first aid before they leave here for high school. 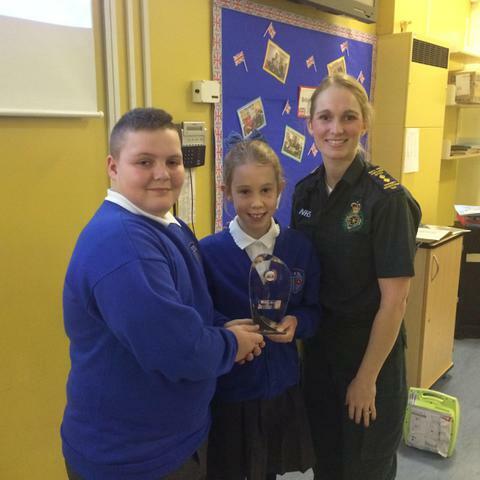 Cheryl Pickstock from North West Ambulance service came into school and presented us with the Cardiac Smart Award which we are very proud of.